Hey there! I finally got a chance to play with the Making Memories-Sabrina paper that I fell in love with. You can NEVER go wrong with Pink & Black! I picked up a 1 1/4 square punch on clearance this weekend at Hobby Lobby for $3.99. Sure beats using my nesties for a quick and easy card like this one. This paper BEGGED to be used along with SU's Top Note die! Spent the entire weekend at my folks house. They've got some major renovation going on! The whole house is being done in beautiful 20 x 20 tile! Goodbye Carpet! Perhaps the cards I made were inspired by all the tile work being done. I've got to include some pics of Miss Penny! She had such a blast hanging out with Chris and I. Looks like you had a great weekend!! 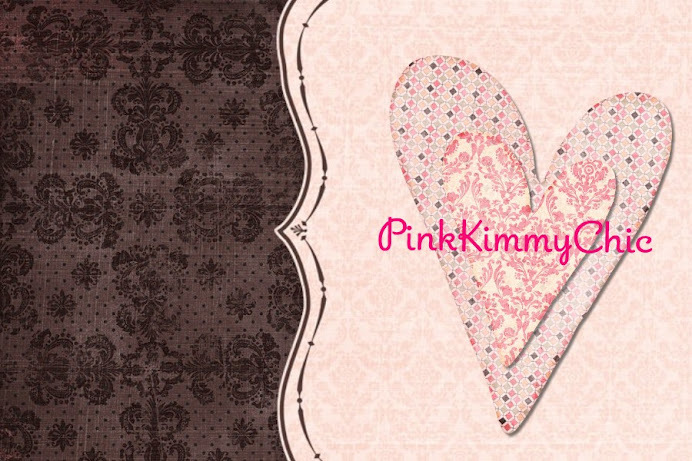 Love your cards Kimmy...that paper just rocks!! Hey Lady! Lovin the pink and black! Penny is a doll! Those cards are just adroable...and your puppy is too cute for words! The cards are cute too!